Mr. Anthus and I were planning our very first cache hide when we came up with a great idea for combining our love of geocache hunting with our love of geocoins. We are working on getting approval to place a multi-stage / puzzle geocoin cache. 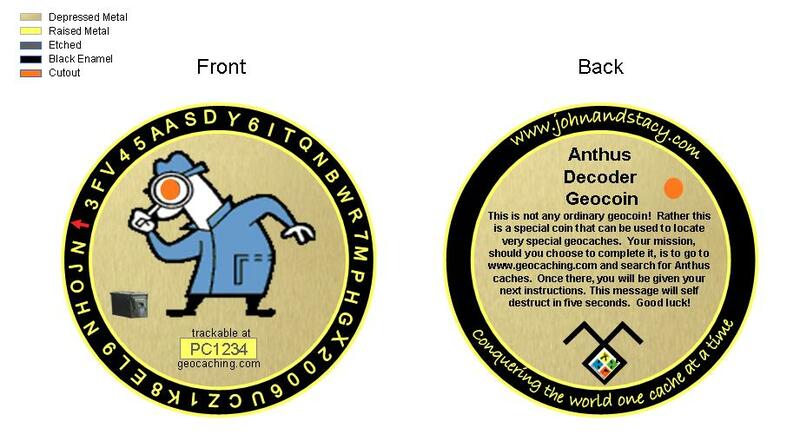 In order to find our cache you will need to use a special Decoder Geocoin that we have created (pictured below). We also hope that other cachers will use our coin to hide their puzzle/coin caches. The Decoder Coins will be placed in our cache, but we will also have some for sale. This is not an order thread. Rather, I would like to have your thoughts on the coin and any suggestions for improvement. - The orange circle is a cutout that when placed over an image of several numbers can reveal a number. Move the coin again to a special spot and reveal another number. Keep continuing until you decode the coordinates. Looks interesting but would caches you HAVE to buy this coin to solve be considered commercial? I'm placing an activated coin in one of the stages of this cache. Cachers will NOT HAVE to purchase the coin. I'm even placing extra coins in the final stage to be prizes, so cachers will not have to purchase the coin and can even score a free coin for thier collection. I love the idea also...But to solve your cache you have to BUY a coin? Never mind question was already answered....I am too slow. Be careful. You might have to go out often for cache maintenance when people start taking the coin needed to solve the cache. You might want to make the one you need to solve the cache a replica. I love the idea also...But to solve your cache you have to BUY a coin? I have to agree with the above poster. see my response above. As I mentioned in my initial post that there will be Decoder Coins in my caches. So, no need for anyone to have to purchase them. OK I think it is a great idea then! Interesting idea, definitely adds a new element to puzzle caches. I'd have a duplicate copy of the coin in the cache, possibly attached to a string just so cachers don't forget to leave it in the cache. Sweet Coin and a GREAT idea! Can't wait to have the final product for sale so we can use it here. Nice. We figure that we'll have to do that. Our cache isn't too far from our house so we can check on it more often. We want to get geocoins back into the caching aspect of geocaching. We thought that using them to solve a cache would be a great way to do that. We figured we put an activated one with a warning on it saying that if it goes missing then they would be spoiling the cache for everyone else. If it happens often enough then we would replace it with a replica. Hopefully by us periodically placing ones that people can keep in the final stage, people won't take the other one. Also, we are thinking of an incentive for people that already have their own coin or a coin in their possession (maybe an activated traveler one they found in another cache). The incentive would be that they get to bypass one of the stages. Here's my thought. First stage contains the message that must be decoded along with coords to the second stage. Second stage contains the activated coin. Third stage is final stage with prizes in it. If you have a decoder coin (whether you purchased one or have one as a TB that you are moving along or someone gave you one) you can bypass the second stage and go directly to the final stage. Those that don't have the coin can still go to Stage 2 and use that coin to deconde the message. I thouht it would be neat to find the Decoder Coin in the wild and then discover that you can use it to get another cache. But I don't want to make anyone buy the coin -- thus Stage 2 was created. Yep, I'd like one also. Nice. Wow! Awesome idea!! i'd buy a few. Great, i like to order one! We already know that the coin will decode the secret code to read: "Be sure to drink your Ovaltine!" ... or is it: "Be sure to buy our coins!"? We'd like one for our collection as well! Coin looks great, would like two when you are ready. I want one too!! It's too cute!! I think it's an excellent idea. I've been thinking of something similar for awhile now. Only I'd like to take it a step further; I want to have a coin made that actually has to be inserted into something at the final cache to get the container open, like you'd see in an Indiana Jones movie, or National Treasure. That way, no one could even use a facsimile of the coin to crack the code. Has anyone ever done this? BTW, if you do make this coin, I'd consider doing a hide myself that uses it at the final stage as well. We don't get much caching travel in this neck of the woods, so I can't imagine that I'd need to buy that many coins to support it. Definately would be interested in buying one if (when) you finish it. How about a coin that the middle spins so you can match up the letters like the hints on gc.com pages? We were already thinking about a coin like that -- to rotate the inner part of the coin more like a combination lock (not like the spinner coins that are already out there). There would be leters out the outside and numbers on the inside or something like that. I have to wait for the coin minter to get back to me on whether that is even possible and how much that would add to the minting cost of a coin. Be sure to drink your Ovaltine! The Decoder Coin is now on pre-sale at my web site at http://www.johnandstacy.com/store_decoder_coin.html. I will be invoicing through PayPal within two weeks. Pre-ordered for 1 of each.